You see the same kind of feminine identity crises in other Hitchcock films. In Rebecca, the creepy Mrs. Danvers does everything she can to overlay the dead wife’s personality and artifice onto the Second Mrs. de Winter, at one point even dressing the poor new wife in an outfit Rebecca once wore. Everything in the house bears the flourished “R” of Rebecca’s monogram—even the stationery in the new Mrs. de Winter’s writing desk. In Shadow of a Doubt, the doppelgangers cross gender lines. Young Charlie (Teresa Wright) and her Uncle Charlie (Joseph Cotton) share more than just a name; their bond is more than just purely familial. And when Uncle Charlie appears to be the cold blooded Merry Widow killer, young Charlie must act. In Notorious, Ingrid Bergman’s identity as a young, flamboyant jet setter is stripped away from her as she is installed in the home of a probably Nazi war criminal. 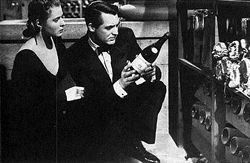 Cary Grant acts as her Svengali, dressing her up and coaching her to play the part.